Michael Pezzulli once again receives the highest possible rating in ability and ethics! - Law Office of Michael F. Pezzulli, P.L.L.C. You are here: Home / Featured / Michael Pezzulli once again receives the highest possible rating in ability and ethics! 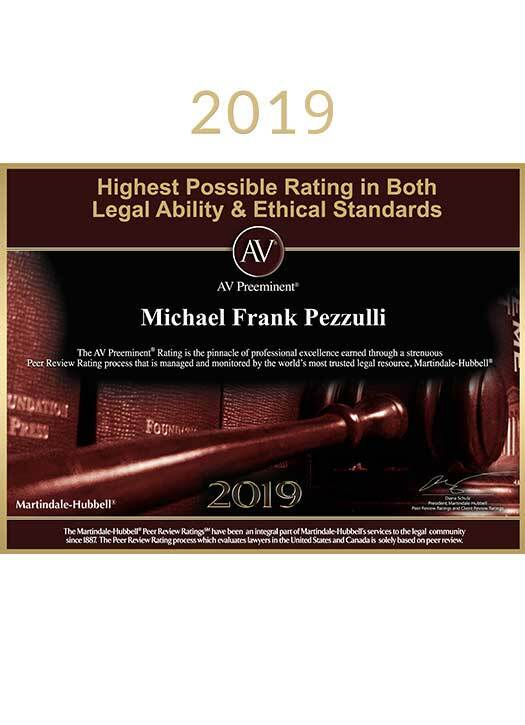 Michael Pezzulli once again receives the highest possible rating in ability and ethics! Michael has received again the highest rating from the Martindale-Hubbell Peer Review Ratings. He has been honored with the AV Preeminent Rating for both Legal Ability and Ethical Standards. This is a rating that is determined by peer review – other attorneys, judges and legal professionals who know Michael and the work he does for his clients.